More brief reviews. The list will become less and less obscure over the next bit so don’t expect, like, more Ramblers-esque stuff. Oh, and I forgot to mention, I’m doing this list based around first theatrical release (excluding festival releases) as opposed to my general “going by US release” fixation, if you’re curious. To be fair, any of the films from the current trilogy (on the verge of being a quadrilogy if Greengrass is semi-successful with Green Zone or something) could have made this list — I decided to narrow it down to one per series to be fair to the competition, so here I decided on my favourite (of course) which is 2004’s The Bourne Supremacy. Looking back on it now, this was one of the more inspired decisions this decade in giving Paul Greengrass the opportunity to helm such a large project, given his lack of experience by that time. Especially considering his only film before this was 2002’s Bloody Sunday which wasn’t an American production or too financially impressive, even though the film itself was. Here he finds himself breeding the habitual tension Liman imbued in the first installment — 02’s The Bourne Identity — with his penchant for the handheld. His decisions behind the camera revitalized (see: redefined) action sequences and now have become a near necessity for people to really take to hand-to-hand combat in film. While its performances aren’t the best and the story captivating but not near brilliant, the entirety of this film’s (and The Bourne Ultimatum’s) success lays solely on Greengrass’ shoulders. In an industry where sequels are often of lesser quality than their predecessors, Paul Greengrass launched this into a darker atmosphere and brought everything one would hope to follow the first part into fruition. One of the best action films there has ever been. I wrote a review for this last June, so I’ll link to it. However, I would just like to take this time to say if you haven’t seen the film yet, see it now. Especially if you’re apart of people who love to do personal awards/keep up with current cinema. A contemporary masterpiece and Souleymane Sy Savane’s warmth and genuineness is the purest I’ve bared witness to in a long, long time. Here’s the review. I deviated greatly into Gaspar Noe’s only film of the decade — unless you count festival releases, which I don’t; which is why Enter the Void isn’t on this list — in a review that I posted pre-TIFF. Yeah, I loved this film. The combination of Noe’s unrelentingly depressive vision and a bitter, bitter story that leaves you feeling dirty, this is really something else. The second most immersing feature I’ve bared witness to — only bested by Enter the Void. Review: Gaspar Noe’s Irreversible. 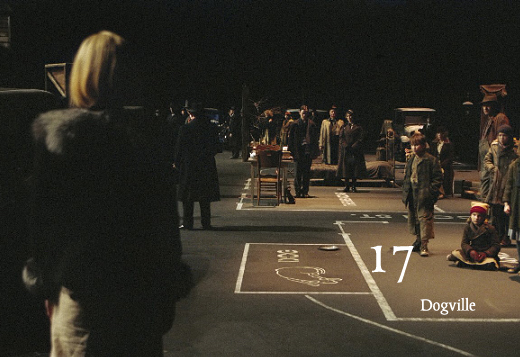 One of the first films I sought after in my youth to help me gain perspective on “quality” cinema was Lars von Trier’s Dogville. Not only did it shape the way I viewed film, but I’m sure in some depressing way it also helped shape the way I view the world. In Dogville, the lead character Grace (Nicole Kidman in a, well, graceful portrayal that is head and shoulders above anything she’s ever done) is a woman getting out of dodge, so to speak. She’s not in tune with society the way her mobster family is, so she scurries off to some desolate little village filled with some of the most glib and loathsome patrons cinema has provided… ever. There are a few good spirits, but it seems to be the town’s intent to collapse this woman’s pure foundations. She’s put through hell and it’s essentially three hours of watching the most loving person being tortured. Many people are familiar with von Trier’s so-called misogyny which is basically an empty criticism of people disliking his work to perpetuate with some “factual” argument. All of his characters are miserable people and he’s stated he writes his female protagonists as himself. Yeah, he’s self-deprecating — not Neil LaBute. While the story is harrowing, there always has to be an extra element for me to adore a feature. Here it’s von Trier’s collision of beloved styles; the Dogme 95 aesthetic set on a stage platform. Even the film’s biggest detractors admire von Trier’s visual independence here; it understandably takes this anti-American tirade to a far more artistic plateau. The cinematography, the “set design”, the editing — it’s a fascinating directorial project with heart. von Trier’s first film in his Grace trilogy, which is yet to be completed, has as much soul as it does a peculiar vision; even if both are filled with melancholy and hatred. I wrote a review for this a few months ago. This is Nobuhiro Yamashita’s second appearance on this list and I am overly excited to get through the rest of his filmography. The review is the final one of the post located here. 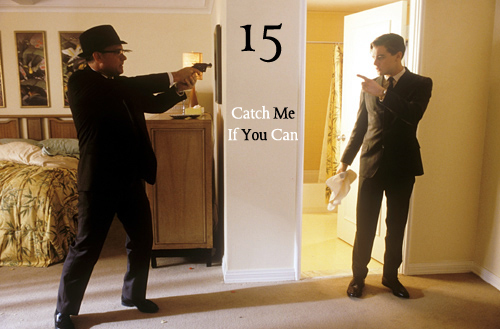 I first caught this in early 2003 and between the Lord of the Rings trilogy and this, Steven Spielberg’s Catch Me If You Can, I found myself becoming a film fan fairly fast. It’s a popular enough film, so I can avoid any preliminary plot discussion. I think what I’m most drawn by by this film is the allure of the vision. Spielberg’s got some swagger inside him and he expels it in large qualities here. Giving Tom Hanks the most honest work in his career (meaning I believed this could be a guy I bump into on the street on any given day and he’d be this way, not that it’s his best performance), Leonardo DiCaprio the most bubbly and boisterous work he’s ever turned out, Christopher Walken a lovable fatherly role that everyone loved and Amy Adams her big break in one of the most adorable turns ever. Spielberg’s vision has never been more concise. Here he shows humility in the themes he tackles, which allows for a much more natural connection between his viewer with his film; at least on this particular occasion. There’s an essence so compelling in Frank Abagnale Jr’s life that I find myself adorning each time I sit down and re-experience a life so well lived. It doesn’t hurt that the story is told from a genuine perspective that lends a favorable view to the criminal and a bitter one to the police — a manipulative decision that I tend to hate in cinema, but love here — but the quiet projection of a young man’s rut being snowballed into something genius and rather epic touches me. That, even if all hope is lost, you can lie your way to an honest gathering of self. Spielberg’s best and I doubt he’ll ever top himself. Back-to-back Leonardo DiCaprio? 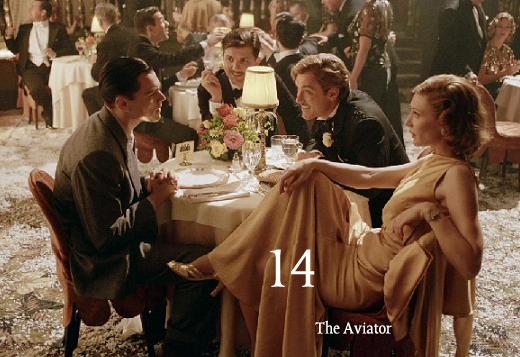 I suppose I’m showing my true colors now… Anyways, after his most disjointed directorial job coming in 2002 that had many questioning Martin Scorsese’s aging mind, he came back two years later with one of the best biopics I’ve ever been subject to in The Aviator. Be it because Howard Hughes’ life was a ride in and of itself or that the film touches on cinematic and neurological escapades, there’s enough interest to sustain this three hour feature without having to compensate for any plotting mistakes. Taking place between the late 1920s and mid 1940s, Martin Scorsese’s second collaboration with Leonardo DiCaprio in as many films resembles cinema of that era. Be it the extravagant design that feels as grandiose as any of the era’s films or the histrionic performances that are mirror to anything those years produced, this film’s long reaching themes and obtusely scaled universe is done in such a remarkable manner that you could believe that, if Howard Hughes were alive, this would be a film he would have produced. A longstanding escapade that ne’er sports a scene that feels out of place and continually perpetuates the pros and cons of big industry. And as a large fan of Leonardo DiCaprio, I easily label his performance as Howard Hughes as his best work yet. His being cast as the millionaire was as ineluctable as the man’s disorder. E. Elias Merhige: a director best known for his penchant for the bizarre with his first feature Begotten where no soundtrack or dialogue is heard and the visuals displayed are a far shot away from happenstance. However, I’m here to salivate over Shadow of the Vampire so lets get to that. Although it’s only 80 minutes long — if you subtract the overly long opening and closing credits — E. Elias Merhige’s latest film packs as potent a punch as any three hour spectacle. Perhaps it’s because it’s so compact that the clout this 2000 feature delivers is found so powerful, but this punch is also attributed to a fantastic ensemble — headed by a literally unrecognizable Willem Dafoe — a macabre tale of the obsessive and a morale that will leave you gasping for air. 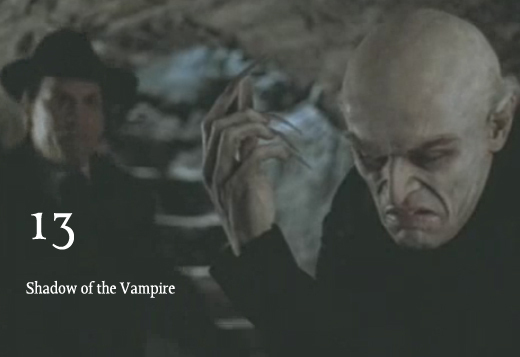 Of course, the factual way this fictional story is presented makes it all the more harrowing and this semi-horror about the making of Nosferatu is exponentially more sorrowful, distressing and overall horrific than the film from which this concept derives itself. Apparently what is submitted to audiences when a twisted director directs a tale about a twisted director is a masterpiece of sorts. The dialogue defines its characters intent and the performers define their souls. Each character from the daffy and obsessively portrayed F.W. Murnau (fantastically accosted by John Malkovich) to the meager actor Gustav (played with intimate trepidation by Eddie Izzard) is a fully fleshed figure and a creature to behold. Of course, the cherry on top of all of this is Willem Dafoe’s paradigm for scary figures. An asphyxiating realization based upon the hearsay of yore in a film that I wish was six hours long. 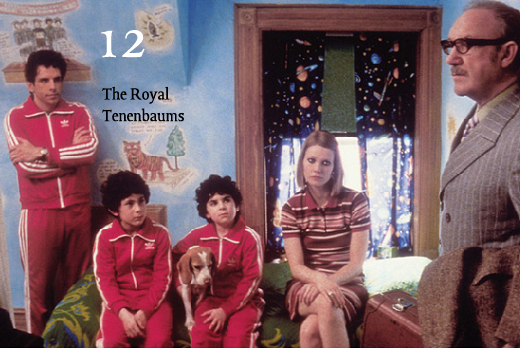 Perhaps the first really quality film I saw in the theaters, at the meager age of 10 I caught The Royal Tenenbaums with my uncle at a second run theater known as The Revue. 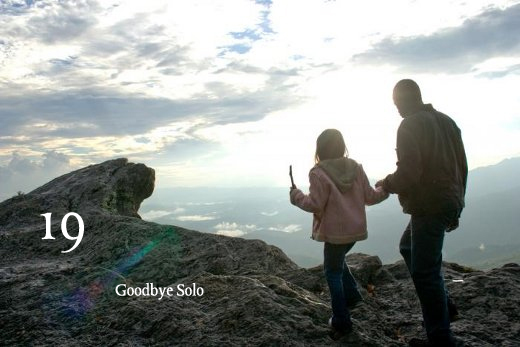 Fitting I review it years later proclaiming it one of the best of the decade. On with the snippet, shall we? The first Wes Anderson film to attack the myriad of problems that a family encounters because of family — as opposed to singular participants in his films like Rushmore and Bottle Rocket — the director/writer expands his horizons and thematic scope to accompany this larger interpretation of the family dynamic. With the majority of characters being lovelorn and neurotic, what this family lacks in variety is made up for in authenticity. Although these people hold peculiar beliefs regarding the purpose of life and career occupations, the parents in Royal and Etheline fortify the sentiment that their vanity is cause for their offspring’s (and one adopted child’s) ablation. Carefully constructed, Wes Anderson’s tacit revelation of suburban sadness has found its significance amongst contemporary cinema and speaks more truths than the bottoms of Snapple caps. If this was not enough, The Royal Tenenbaums holds a rather extraordinary ensemble headlined by one of my utmost favourite performances in history with Gwyneth Paltrow’s rousing of Margot Tenenbaum. Her tessitura of an adult’s teenage angst and a marooned adornment for her brother Richie (a depressing evocation of said fleeting love by Luke Wilson) causes Paltrow’s diminutive stature to ferment amongst an already disheartening tale. With desiccated humor and acrimonious characters, it’s a wonder how warming this film tends to be. Do you know when you watch a film and are immediately stricken by it, so you watch it again in succession? This is one of the few films that gets such an honor by me and one that I watched three times of the course of two days; I don’t believe I can say the same for any other film. Produced by Netflix, The Duplass Brothers’ The Puffy Chair is as minimalist as they come. A feature about the fleeting romances that this generation produces and attempting to rekindle the cadence that comes with a functioning family, the story follows Josh (Mark Duplass) and Emily (Katie Aselton), a couple on the verge of a breakup. After it’s made clear Josh cares more for his hardly rewarding occupation as a band manager — blowing his girlfriend off for call after call — he pulls a Say Anything and blares a cutesy indie song through her window, asking her to come along with him in picking up a puffy chair for his father’s birthday. With Josh’s brother Rhett coming along for the ride midway through the feature – a character who gives the contrasting opinion of Josh’s clear obsession with the materialistic – the three differentiating characters will hit you on three levels. Whether you’re compassionate, salacious or are penitent (among other things), the characters will cause you at least an inkling of self-reflection. If you’re like me and see yourself in each of the characters, well the more examination cinema can cause of one’s self the better. Intelligent comprised of benevolently commonplace humor and dialogue that you’ve heard or spoken at one time or another, the greatest offspring that mumblecore has provided doesn’t mind taking its story one step at a time, walking its way to a genuine conclusion that will leave you pensive. Fantastic amateur actors and without a spurious note, The Puffy Chair is scant with its comfort and as serious as banal existence can be. This entry was posted in Best Of The Decade, Film Talk (Lists and Discussion). Say, I know it’s been a while, but where’s the third installment of this, Tyler? Did I miss it somehow, or did you just sort of lose interest in wrapping it up? And while I’m posting here, I may as well add that I really enjoy reading your reviews, which have improved in quality astronomically since I first dropped in here about a year ago and are now very often excellent. Seriously, keep up the good work. Thanks. My computer kept having to go to the shop, so when I was just about to get all the images done I had to redo it and all that. So now that it’s finally (and supposedly good) I’ll get all the images again and get one up within the week. And a review for The Ghost Writer, I hope. I’ve also been busy with writing my script(s).